To work out the depth the diamond formed at – and hence the origins of this water – the team again turned to the inclusion. It is made of a ferropericlase mineral, which is composed of iron and magnesium oxide, and can also absorb other metals such as chromium, aluminium and titanium at ultra-high temperatures and pressures typical of the lower mantle. 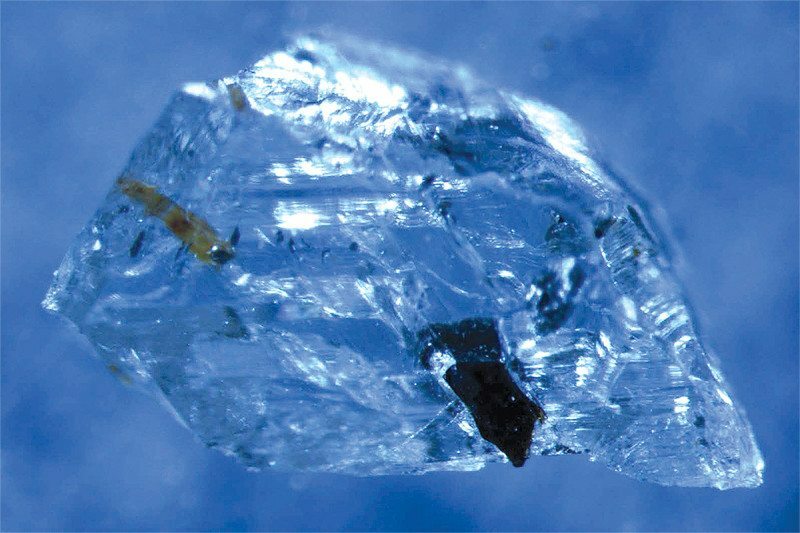 Jacobsen found that these additional metals had separated from the ferropericlase – something that happens in the milder conditions a diamond experiences as it edges up through shallower depths. But for the metals to be present at all, the diamond must have originated in the intense conditions of the lower mantle (Lithos, doi.org/btcn). “Based on the composition of the trapped mineral, we speculate that the depth was around 1000 kilometres,” says Jacobsen. His team has previously found evidence of massive amounts of water some 600 kilometres down, mixed in with rock. “Water clearly has a role in plate tectonics, and we didn’t know before how deep these effects could reach,” he says. “It has implications for the origin of water on the planet.” For example, it is possible that Earth had water from day one in the very dust and rocks that first formed it. But it’s still not clear exactly how water got so far down. It may have arrived in the mantle even earlier than 90 million years ago, through sedimentary oceanic crust burrowing downwards as primitive tectonic plates thrust against and past each other. The hope is that such research will yield insights into how our oceans and atmosphere formed in the first place.